So I’m starting to think next year maybe the Easter Bunny should leave fruit baskets instead of baskets overflowing with candy and chocolate I can’t stop eating. What is my sugar problem (I say that as I sit here and shove snickers bars into my mouth)!? At least I’m not in denial, the first step to overcoming a problem is admitting you have one right? Okay well truthfully it’s not a problem I want to overcome. Sugar keeps me happy and emotionally healthy =). 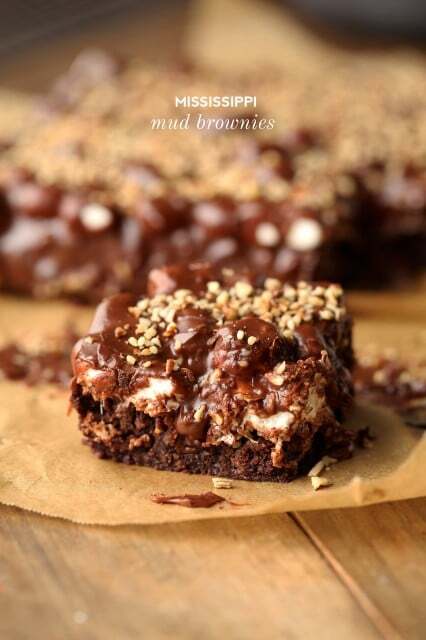 With that said, onto these luxurious Mississippi Mud Brownies. Can the words “luxurious” and “mud” go together? Oh yes! When it comes to these brownies. 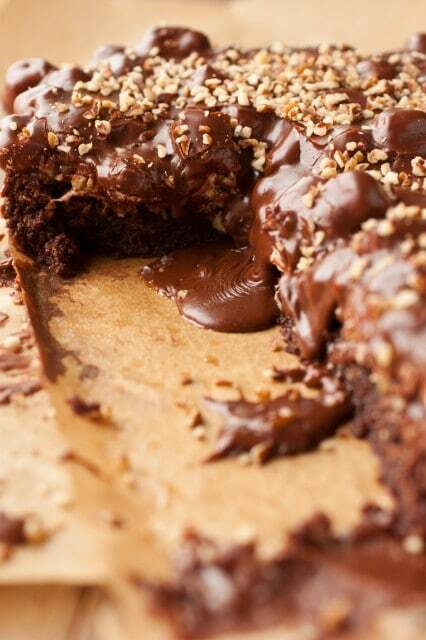 My sister always made a version of these when I was younger, she’d make them with the box brownie mix and I don’t think she ever added nuts in them. I always loved those, which inspired me to make this version with a homemade brownie base. 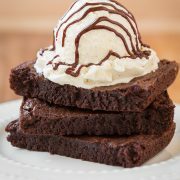 There are plenty of Mississippi Mud Brownie recipes out there but I thought they could use a little more cocoa than what the average has – so I made these as such. Yes many recipes will say to wait for them to cool, but I say why? I say eat them like the “muddy” mess they become when you dig into them warm. The name must have come from someone who, like me, doesn’t have the strength to wait 2 hours for a pan of brownies to cool. 2 hours! That’s just painful if you ask me =). 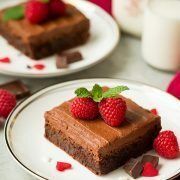 Yes if you want them cut nice and pretty for friends, a party, your grandma, then you can wait for the lengthy cooling process or you can shlop them on a plate and serve as they should be – something like a messy, warm brownie cobbler. One side note, I didn’t mix the nuts into the brownie batter but I wished I would have because it kind of created a barrier that prevented my marshmallows from sticking to the top of the brownies (because that is where I added half of them on mine). So, I changed that accordingly in the recipe below. Also, I thought toasting the marshmallows would be a little something to make them even better and add a layer of roasty toasty goodness but it is completely optional so if you don’t have a kitchen torch simply skip that step. Enjoy, and try to keep the beautiful chocolate mess from covering the entire lower half of you face and smile with those chocolate covered teeth, oh how they’ll shine =)! Preheat oven to 325 degrees. Line an 8x8-inch baking dish with parchment or aluminum foil, if using foil spray with cooking spray or brush with melted butter. In a large mixing bowl, whisk together flour, cocoa powder, granulated sugar, brown sugar and salt until well blended. Using a wooden spoon stir in melted butter and mix until combined. Add eggs and vanilla and stir until blended (mixture will be thick). Fold in 1/2 cup chopped pecans. 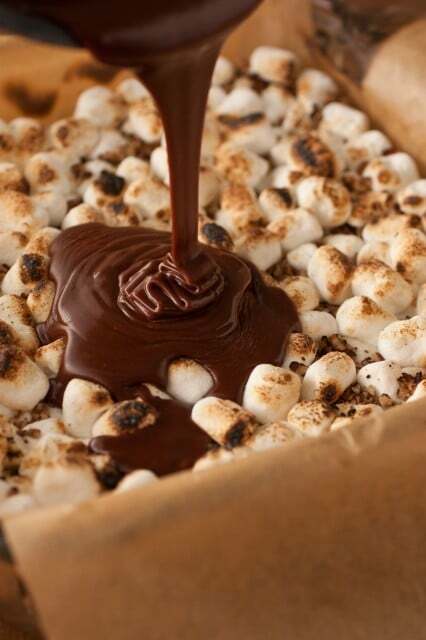 Pour mixture into prepared baking dish and bake in preheated oven 35 - 37 minutes (under-bake slightly as you'll be returning them to oven to cook marshmallows). Remove from oven and sprinkle top evenly with marshmallows then return to oven and bake about 4 minutes longer until marshmallows puff slightly. Remove from oven and allow to cool for 5 minutes then toast tops of marshmallows with a kitchen torch if desired (be very carefully around parchment paper - I lit mine on fire. oops). Pour and spread chocolate frosting evenly over top (just after preparing frosting as it will begin to set as it cools), sprinkle top with remaining nuts. 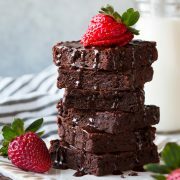 Allow to cool completely if desired (and if you have the patience to wait, it will take about 2 hours), or allow to cool slightly (you'll have runny frosting and unevenly cut brownies - but they are amazing this way). Cut into squares and store in an airtight container. For the frosting: In a small saucepan, melt butter over medium-high heat, stirring frequently. Add milk and cocoa powder and cook whisking constantly until mixture has thickened, about 2 minutes. Remove from heat and using an electric hand mixer, stir in vanilla and powdered sugar. Use frosting immediately.